“Bethany has become a source of inspiration to millions through her story of determination, faith and hope. In 2003, Bethany lost her left arm while surfing to a 14-foot tiger shark. Rather than let her career as a rising surf star come crashing down, Bethany miraculously returned to the water one month after the attack, a year later won her first National title, and has since realized her dream of surfing professionally. 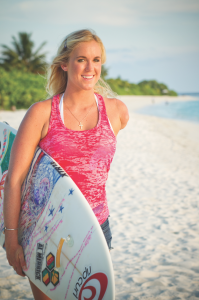 Her unbelievably positive attitude fascinated the world, and her story has been told in an autobiography and later adapted to the 2011 film, Soul Surfer. Recently married, Bethany and her husband, Adam Dirks, are involved in many charitable efforts, including Friends of Bethany, which she and her family created to help shark attack survivors, traumatic amputees, and serves to inspire others through her life story. Bethany continues to inspire individuals of all abilities, including adaptive surfers and everyday heroes like Meghan Roswick and Kris Gulden. 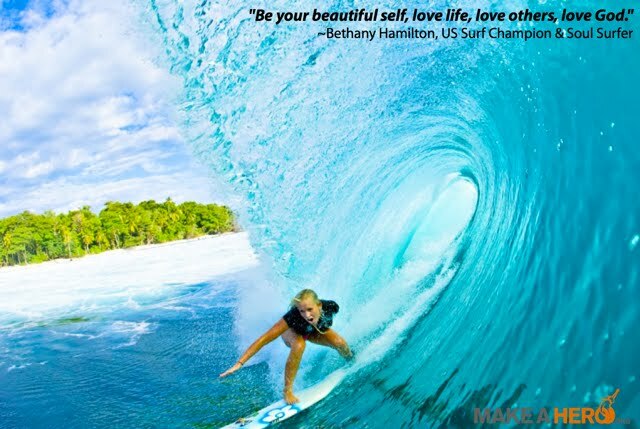 Bethany Hamilton is one of the athlete ambassadors featured in Make A Hero’s upcoming film, ‘The Current’, where she shares her story, and speaks about her relationship with the water and how, after a shark attack, she overcame her fear and returned to her passion of surfing (view film trailer, below). Make A Hero would also like to congratulate Bethany as she takes the next step in her relationship and celebrates her recent marriage –> read the People Magazine article, by clicking here. How has Bethany inspired you!? nobodies perfect she has 1 arm. she isn’t perfect because she only has one arm. from this web site, and your views are pleasant designed for new people. last threeats by” Anonymous” turned out tto be very lively on them. Haha, shouldn’t you be charging for that kind of knge?edowl! Kind of sweet sadness, isn’t it? You are like me in this respect… ,I too, grow fond of houses I’ve lived in, cars I’ve driven, clothes I’ve loved and certain, special, coffee mugs…. the list goes on…. I’ve loved your apt. in that old house, too. So unique, so quirky, so home. I’m just glad that you are moving into a wonderful, new place to put your mark on and make your home. Happy Moving Day !!! a process the company must go through to complete their jobs. Paying premiums for Work Comp Insurance requires yyou tto draft a budget ecent enough too cover all you employees. wow you are an amazing women. Keep being a survivor and showing those with a disability it doesn’t have to end their life. I work for a center for Independent Living KEEP UP THE GREAT WORK! I was diagnosed 2 years ago, with Stage 4 Prostate cancer. I have been a surfer all my life and continue to do so. It is with Bethany’s courage and inspiration that I continue to stay strong and fight the good fight. She has truly changed the life of many and will continue to do so! Thanks to her for keeping us all in good faith and belief in humanity! Bethany is the triumph of the human spirit…..I truly admire her courage and strength!!! That inhg’stis perfect for what I need. Thanks!